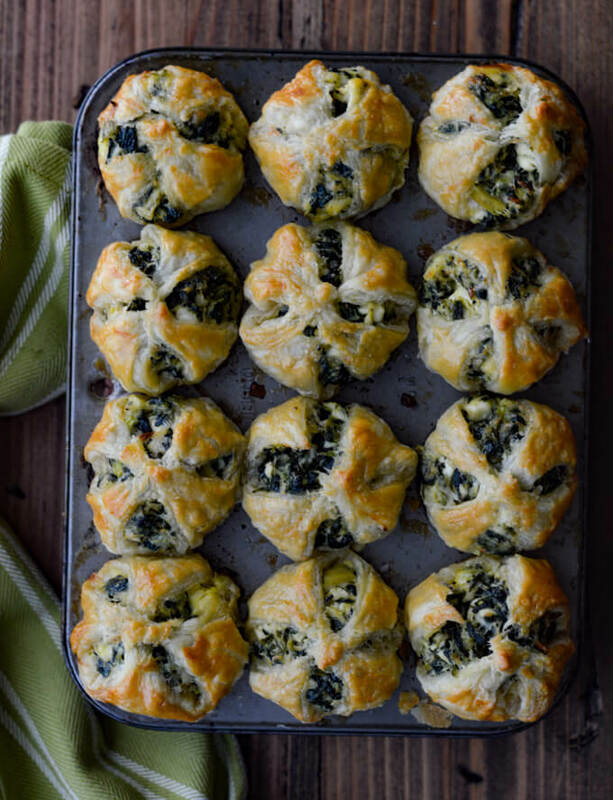 These Spinach and Feta Puff Pastry Appetizers are loaded with savory flavors of garlic, green onions, artichokes and salty cheeses. It is a buttery puff of goodness that just about melts in your mouth. Simple make-ahead finger food that your guests will devour. I’m a sucker for “itsy-bitsy” things. For example, a newborn’s perfectly wrinkled feet, an eight-week-old golden doodle with puppy breath, a tiny cup of espresso that gets me pumped for action, a flower bulb sprouting in Spring, plus a million more “tiny” things on my list. 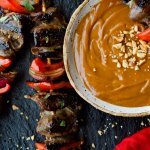 When it comes to food, one of my favorite has got to be bitesize appetizers. There’s something cute and enticing about a food item you can just pop in your mouth. 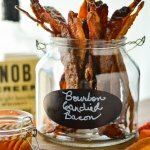 Who has the willpower to turn away from Bourbon Candied Bacon or Mini Taco Wonton Cups? I know I don’t! The Puff Pastry makes this a simple appetizer to throw together. Open the package, cut the dough, and place the squares into the muffin tins. It doesn’t get any easier than that. No kneading, no rising, no rolling out. And of course what is better than puff pastry? 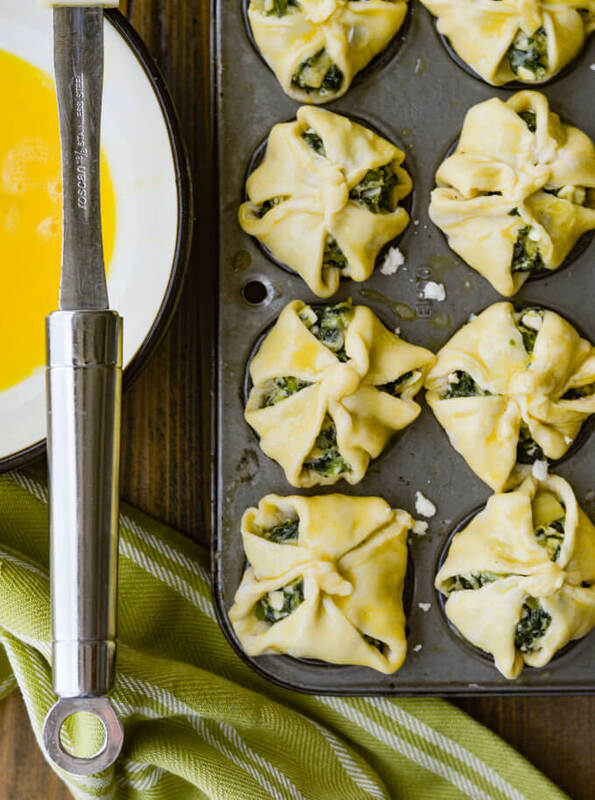 The flaky, buttery crust is exactly what the spinach, artichokes and cheese desire to make this appetizer so scrumptious. The ingredients together create an explosion of flavors. 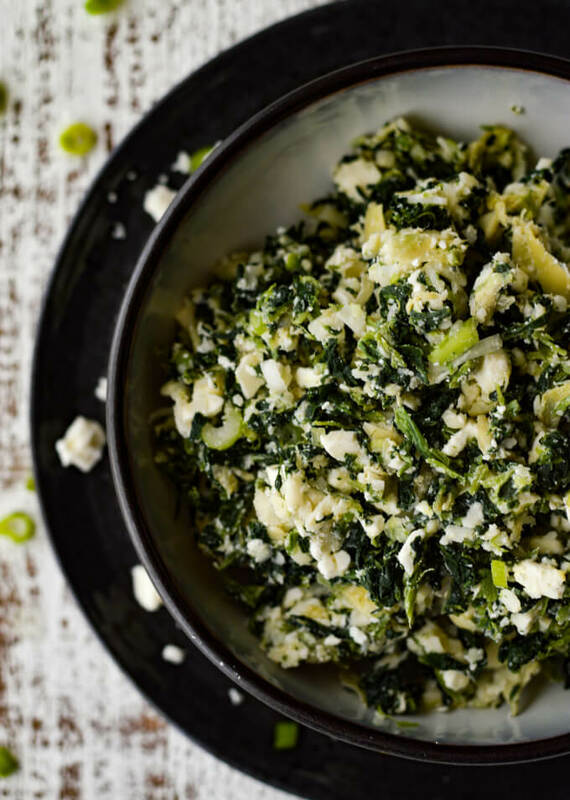 Whenever you fuse spinach, artichoke hearts, Parmigiano Reggiano, feta cheese and of course fresh garlic it’s like bringing a “party” to your taste buds. You can make these ahead of time and bake them right before you’re ready to serve them. It’s always a plus, especially when planning a dinner party or a get-together if the recipe can be made a day or two ahead. Life becomes much more simple that way. 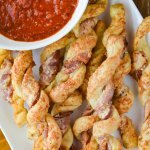 This finger food is an ideal bitesize to throw in your mouth without any mess or fuss. They’re so simple for anyone to just grab and go. No need for plates or forks. What a great “on-the-run” snack. One significant step you will NOT want to skip is squeezing as much water as possible out of both the spinach and the artichokes, separately. Too much liquid will make for soggy appetizers. I start with a metal strainer to drain the liquid and end twisting each of these in a cheesecloth until they are dry to the touch. Puff Pastry can be a little tricky if you let it set out to room temperature. It becomes sticky and hard to handle. Keep each sheet in the refrigerator and covered in a large ziplock bag until ready to use. Flour the surface and roll it out to 10 x 10-inch square. You can use a sharp knife but I have found that a pizza cutter works very well to cut nine equal squares per sheet. Unbaked Puff Pastry last for about two or three days in the refrigerator. I tried to use it after about 4 days and it didn’t have the same texture and puff as my fresh package did. 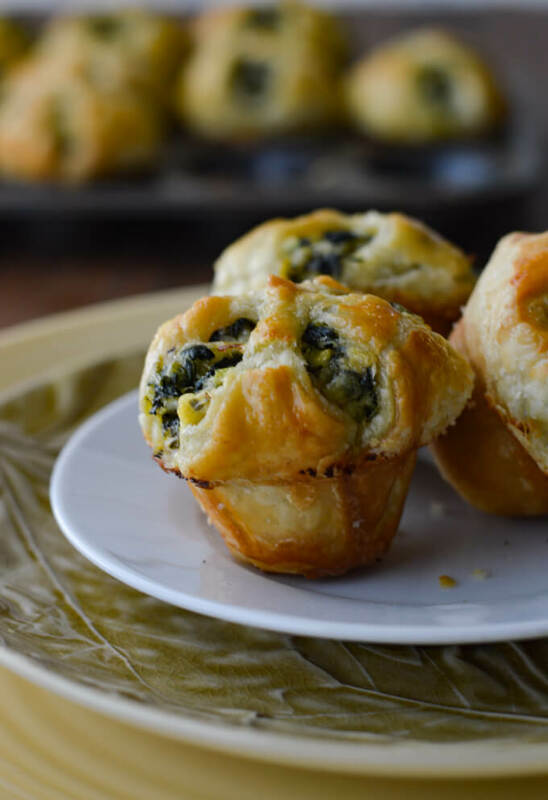 Press the puff pastry square into both the bottom and sides of a greased mini muffin pan. A heaping tablespoon of the spinach mixture is the perfect amount to fill the square. Bring each corner up and twist in order to seal it. For a pretty look, leave a little bit of the green to show through the cracks. Use an egg wash to brush on the top of the unbaked appetizer. This will give it a glossy sheen and a nice golden hue. You’ll want to bake these in a preheated 400°F oven for about 20-25 minutes or until they are a golden brown. When you remove them from the oven, let them sit for about 5 minutes. Then with a butter knife, gently loosen the appetizers and individually tilt them in the pan until they’re somewhat cooled. You can serve them warm or they are just as awesome at room temperature. In my opinion, the most important aspect of preparing for any get-together is “make-ahead” food. This removes the frazzle of the “day-of” prep. I hate being hidden in the kitchen still throwing things together while I miss out on the fun happening in the other room. 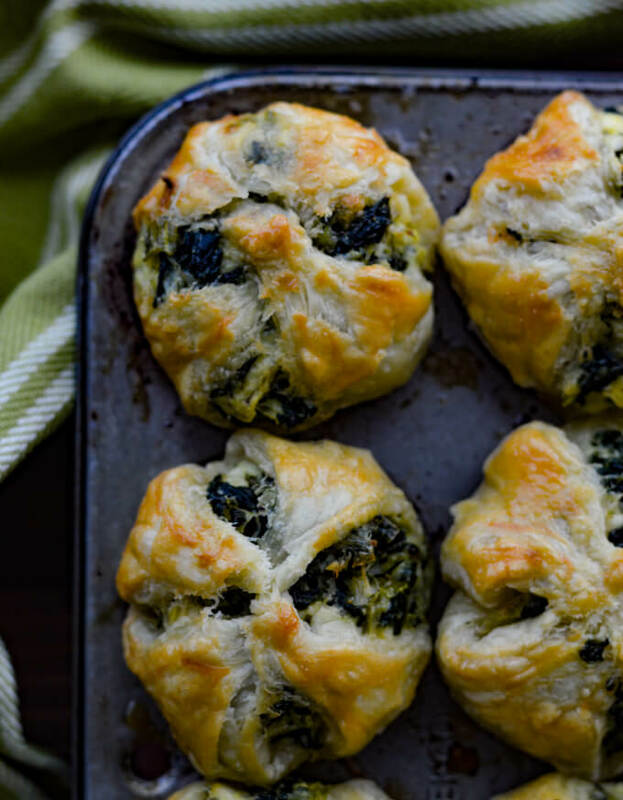 Speaking of make-ahead, these Spinach and Feta Puff Pastry Appetizers are so convenient. You can prepare them in the mini muffin pans, and freeze them before baking. When they are frozen solid, pop them out of the pans and place them in a freezer bag to head back into the freezer. When ready to bake, Place them back in the muffin tins, thaw completely and bake according to the instructions in the recipe. Appetizers made with Puff Pastry is best eaten the day they are baked. Appetizers, according to Michael Scott of The Office, are “appe-teasers.” They have a flirting aspect that gives us a little taste of yumminess but keeps us coming back for more. 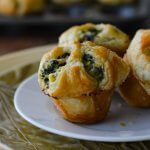 And these Spinach and Feta Puff Pastry Appetizers are definitely a tasty teaser. 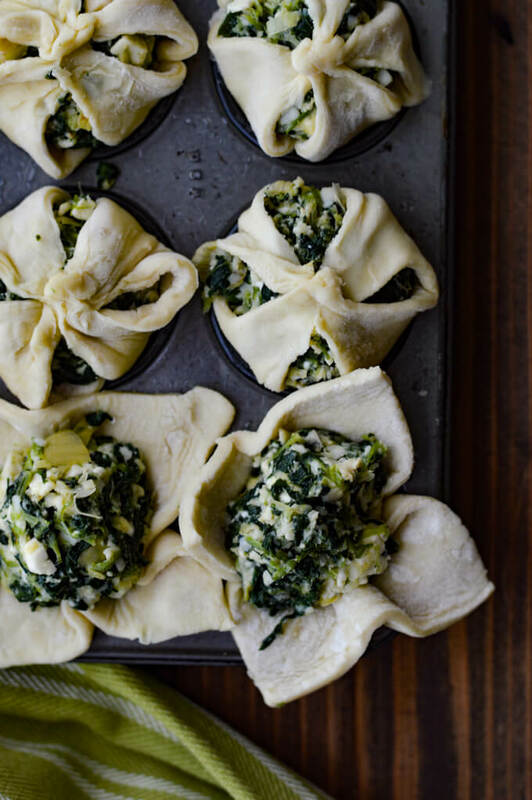 Spinach, artichokes, green onions, garlic, and feta are the ideal blending of savory flavors to accompany the flaky puff pastry. I guarantee you will want to make a double batch if you’re having a party because these little nibbles will be gone in a flash. 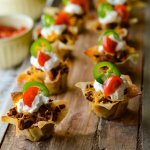 One thing that works well to keep a party moving is having different appetizers at different places in your home. 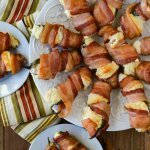 You could place a platter of “Stuffed Jalapeño Poppers” on the deck, a plate of “Mini Taco Wonton Cups” on your coffee table, and these Spinach and Feta Puff Pastry Appetizers on your kitchen bar. This movement keeps your party from becoming stagnant. It also helps the flow of discussion which allows your guests to become acquainted and relaxed. Food always gets a party started. I’m so glad you like these appetizers. They are a wonderful starter to any party with the buttery, flaky pastry. Thanks so much for your comment.